Doors open at 5:00 p.m., show starts at 6:30 p.m.
General Admission $43.50. Service fees not included. After five genre-defining studio albums, the Pixies disbanded in 1993 before launching their reunion tour in 2004. 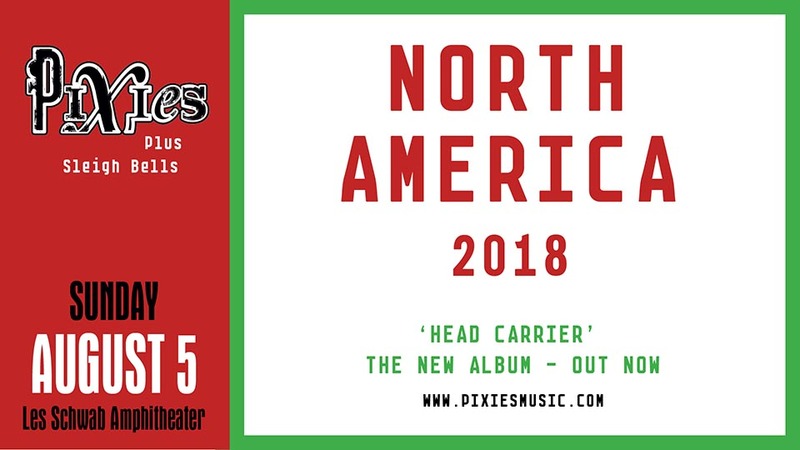 Newly energized, the Pixies played to packed houses across the globe for seven years – a longer period of time than they were originally together. But writing, recording and releasing new music was something that the band had been wanting to do for a long time, so they secretly booked studio time in Wales for the fall of 2012. Six days into the recording, founding bassist Kim Deal decided to leave the band; Black Francis, Joey Santiago and David Lovering made the decision to carry on, working with a variety of touring bassists, something they’d never done. They seem to have done alright. Indie Cindy was released in 2014 and Head Carrier in 2016. The Pixies live on. God save the Pixies.